In these days of inconsistent and inclement wintry weather, the forecast rarely calls for a perfect day that actually materializes. But when it does, we have to hit it hard and long. At least that’s what I told Dorothy to explain how late I was coming home. She retorted that I say the same thing about chasing it in vain all day when we have super marginal conditions. Okay, fair point. But the memory of those marginal days is somehow erased by the sheer perfection of days like today. It was the best day at Dillingham I’ve ever seen. The light north forecast materialized perfectly. The day dawned cold and cloudless and practically windless. A dozen pilots came out, and eight flew from the knob, all of them getting up and flying as long as they wanted, including three first timers from that launch. There was plenty of ridge lift, but the thermals were the real attraction. I caught a perfect one over Kealia that took me up and back to four grand over Makua, and that’s when I knew it was a special day. I flew my farthest and highest flight out there ever, connecting thermals to Kaala and back, reaching 4,300 feet and covering 29 miles in just over four hours. 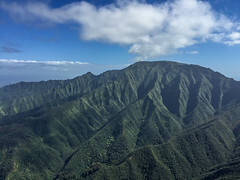 I ended up a couple ridges past the Benedictine Monastery, bobbing up and down in the heavenly thermals there for quite a while, listening to the explosions of the Schofield training exercises, and wondering how high I needed to be to make it to Haleiwa. The last time we had a day like this I had a couple of crazy wingmen to keep me company. Today I was all alone for the cross country mission. I bet if I’d had company we could have explored even farther. As it was, I was reluctant to end my flight by dirting out, and I was eager to rejoin my buddies, and to drink their cold beverages. So I turned around behind Waialua and slowly retraced my path. A lot of us had wondered if KMX might have been working today. Bonnie and I stopped there on the way out, driving up and hiking to the north launch to check it out. But it seemed a bit too light and north, so we continued to Dillingham. Jeff and Harvey did the same thing, hitting KMX first and scoping it out from below, before coming out to Dillingham. Duck stopped at KMX as well, and drove up, and hiked out, and he actually decided to launch! He was on the radio with us while we were up at Dillingham. He said it was a bit too light, and he scratched for an extended sledder, and a top landing in the rough, before driving out to join us for the after party on the beach at Camp Erdman. I had fun playing with the camera on my new phone and with my new GoPro. I am including pictures here but the video will take a while to put together. Scrappy got a video of my stylish beach landing that I hope he’ll post up! Thanks to Reaper and his brother Dave for the refreshments! Roll call: Drew, Steve, Bonnie, me, AK Sylvain, Reaper, Scrappy, Divot Steve, Jeff, Harvey, Maui Josh (? ), Duck. If anyone says that I fly all the time, I am using this one as an example. I got stuck at home till the wee hours and then grabbed a 20 minute Makapuu flight with the Tandem duo, Frank and Alegra. It was barely enough to blow the cob webs out. What can I comment on this one?......Good job? Congrats? Wish I was there?..........NOPE I'll just go with You Lucky Bastards! Alex I looked at your track log, YOU hit Airspace!!!! Yes, you did NASA has a flight path for the shuttle at that altitude. Nice 20+ turns by the runway. I guess I can just pray theirs a next time. Nice!! Very well written...so glad I got to be there to experience the oerfect day out there with you--sorry, I'm not an xc-kind-of pilot or I would have joined you. "A little over four hours"?! Try five and a half! I flew for four hours and kept waiting for you to land and I kept shivering and shivering, and my little teeth chattered - finally, I came down. What an awesome day...and a great vacation!! Thanks everyone! It was so good to fly with you again!